WOW! 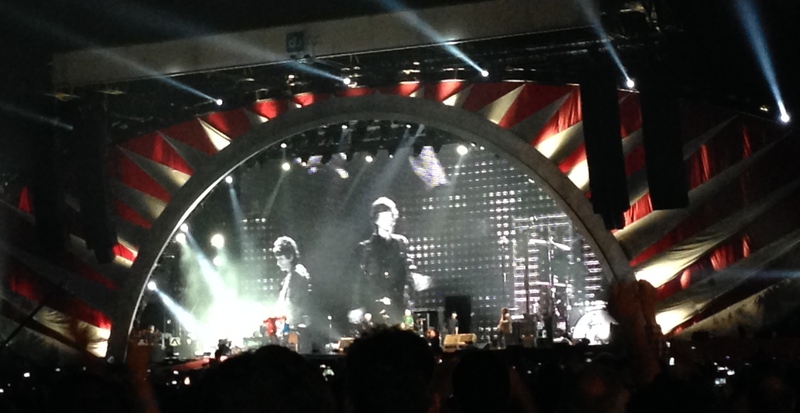 That’s my opening word for this post and it refers to the geriatric musicians (or rock dinosaurs as I read them referred to in one review) that rocked and rolled their way to the core of the capital here in the UAE last night, the totally awesome Rolling Stones. These boys (boys is probably stretching it a bit far maybe pensioners) have lived a well documented rock and roll hedonistic lifestyle to the max and they may look a little craggy now and rough around the edges but they are nowhere near their sell-by dates. They arrived on stage earlier than expected and performed a set list of nineteen songs including two encores from a back catalogue of over 100 singles. Fantastic! Last night was the opening night of the ’14 ON FIRE’ tour and surprisingly the first time the band have performed in the Middle East especially considering they have been in the business for over fifty years. To celebrate the bands debut performance in the region, UAE residents were asked to vote for their favourite track in a three day online poll with ‘Gimme Shelter’ declared the most popular and performed as the penultimate song in the main set list. 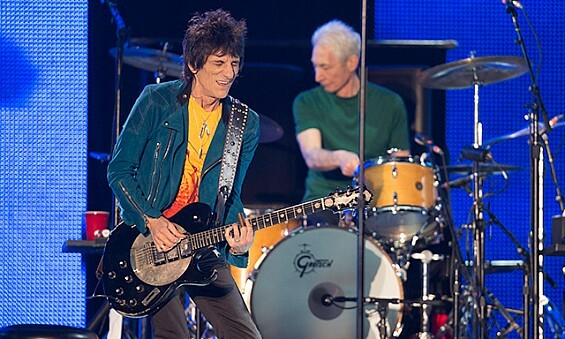 Even with a combined age of 278, Mick Jagger, Keith Richards, Ronnie Wood and Charlie Watts rocked a packed Du Arena with two hours of non-stop old school tunes interjected with Jagger’s distinctive British accent, even attempting some arabic and as a welcome to the crowd tried to remember and name the seven Emirate states (missing out only Ajman) as he interacted with the buzzing audience. From the crowd pleasing first song ‘Start me up’ to the two encores, the Stones were on fire as the tour name suggested and did not disappoint. Jagger was on fine form, dressed in a sparkly red jacket for the opening number, changing several times during the show in his own flamboyant way (there was a feather boa at one point), delivering each song perfectly as he strutted across the stage, still the consummate frontman he ever was, even now at the ripe age of 70. Watts’s, the bands oldest member at 72, is still a powerful drummer commanding the beat that guitarists Richards also 70 and the baby of the group Woods, 66 strummed along too, busting out the chords of so many well known and loved hits! The sell out crowd was a fantastic mix of all nationalities and those young and old, from the older ones who remember the Stones from back in the day and have seen them before to those, like the teenager and her friends, who experienced firsthand some pure old school rock and roll. A night of musical history right here in the UAE that was awesome not to be missed! ‘It’s Only Rock ‘N’ Roll (But I Like It)’ and ‘You Got Me Rocking’ were followed by ‘Tumbling Dice’ and the funky ‘Emotional Rescue’, ‘Angie’, ‘Doom And Gloom’ and ‘Paint It Black’ were next. ‘Honky Tonk Women’ went down a storm with the crowd before things mellowed out slightly when Richards took control over the lead vocals for two blues numbers ‘Slipping Away’ and ‘Before They Make Me Run’, accompanied by Woods, with a cigarette hanging from his mouth. I must admit I had never heard quite a few of the tracks before but enjoyed them nevertheless! Former band member and special guest, guitarist Mick Taylor (part of the Stones line-up from 1969-74) joined Richards on stage backing up ‘Slipping Away’ and was introduced to the crowd as he played ‘Midnight Rambler’ with a tuneful Jagger on harmonica. ‘Miss You’ came before the aforementioned “Gimme Shelter’ and the crowd went wild for the much-anticipated ‘Jumpin’ Jack Flash’ which closed the show. ‘Sympathy For The Devil’ and ‘Brown Sugar’ made their appearance in the encore along with my Stones favourite, the pensive ‘You Can’t Always Get What You Want’ which was accompanied by The Al Khubairat Singers, a choral group made up of students and teachers from the teenagers school BSAK (British School Al Khubairat). 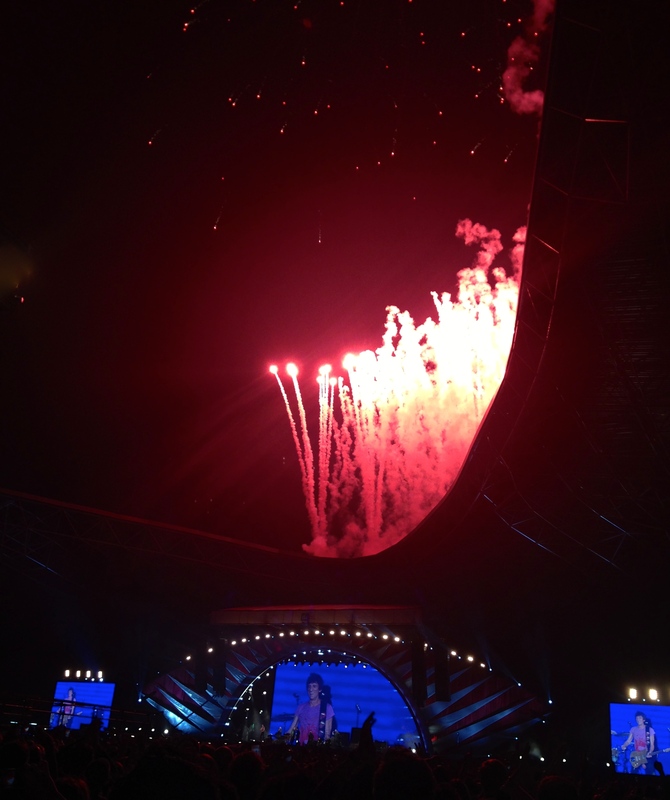 What a fantastic story to tell future generations for those singers, I sang on stage with the Rolling Stones! Amazing! The finale was of course ‘(I Can’t Get No) Satisfaction’ which sent the crowd into one last frenzy of song and dance and signalled the end of the show, the last note setting off a firework display from the arenas roof and the task of getting out of the venue began, we dived into a nearby hotel for drinks and food by the pool delaying the wait for a taxi from a packed Yas Island. Apart from missing another one of my favs ‘Get off of my Cloud’ that I was hoping to hear and the iconic ‘Ruby Tuesday’ and ‘Wild Horses’ that others were hoping for, it was a faultless set executed to perfection and I feel very privileged that I was there, seeing one of the best bands in the world, while I still can. 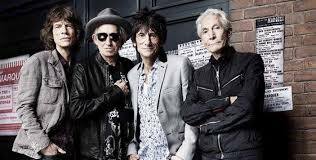 If I am completely honest when I booked the tickets back in early December I was a little sceptic that the oldest rockers in town would make it to the concert date and that was a opinion shared by a few other ticket holders here too! Age is obviously not an issue to these guys as they leave Abu Dhabi in their private jet to fly to Japan, the second stop on this tour of Asia, for three sell-out shows at the Tokyo Dome. The tour will then take them on to Macau, Shanghai, Singapore, Australia and New Zealand. A fantastic night filled with an incredible energetic performance that celebrated Rock’n’Roll by four musicians who put the mimers and divas of the music business to shame! 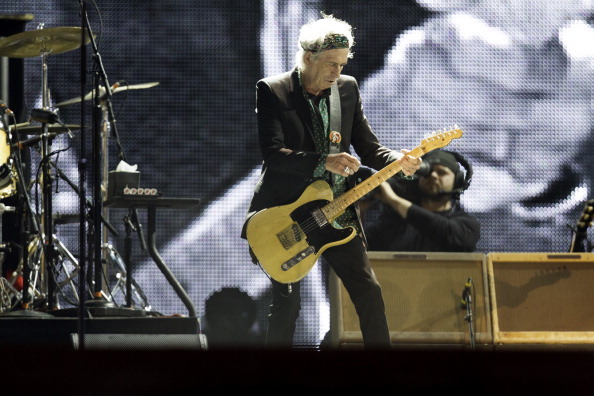 A great time was had by all and we certainly got ‘Satisfaction’ from The Rolling Stones and all they had to offer the rapacious 30,000 strong Abu Dhabi crowd packed into the Du Arena. 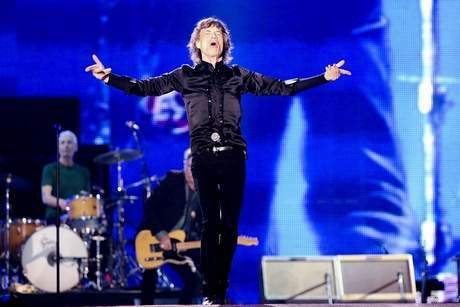 Jagger’s attempt at some arabic phrases endeared him to the crowd and that combined with his flamboyant outfits and legendary strut meant he played his frontman role to perfection, but my favourite quote of the night goes to Richards who said “It’s good to be here, its good to be anywhere!”. 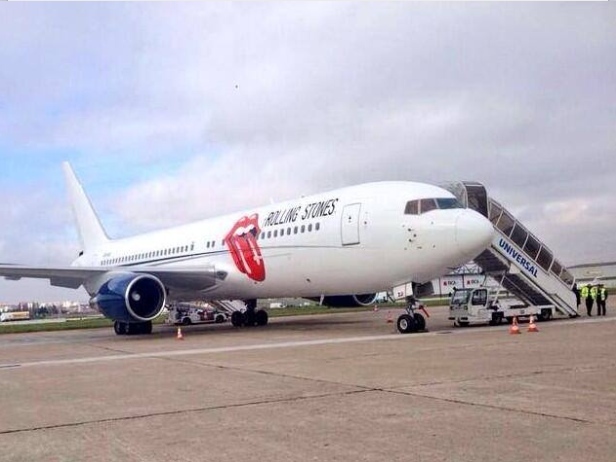 The Rolling Stones are the longest performing rock band in history. 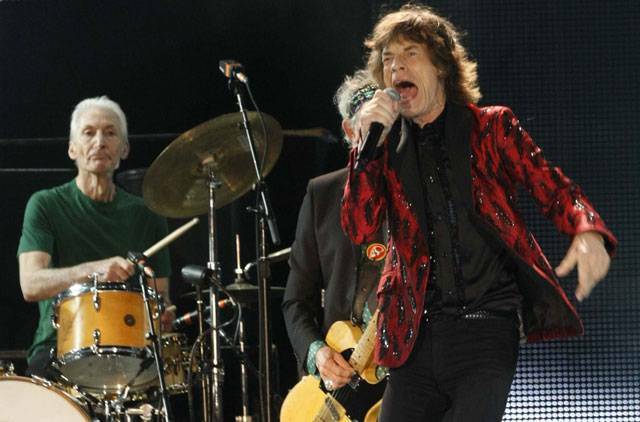 The group was formed by schoolmates Mick Jagger and Keith Richards in 1962, Charlie Watts is also an original member. The song ‘Gimme Shelter’ was used in four Martin Scorsese films. Andy Warhol designed the Sticky Fingers album cover. John Lennon and Paul McCartney wrote the hit song I Wanna Be Your Man. Keith Richards was arrested for heroin possession in 1977. The group was inducted into the Rock and Roll Hall of Fame in 1989. The Rolling Stones celebrated their 50th anniversary in the summer of 2012 by releasing a hardback book entitled ‘50′. 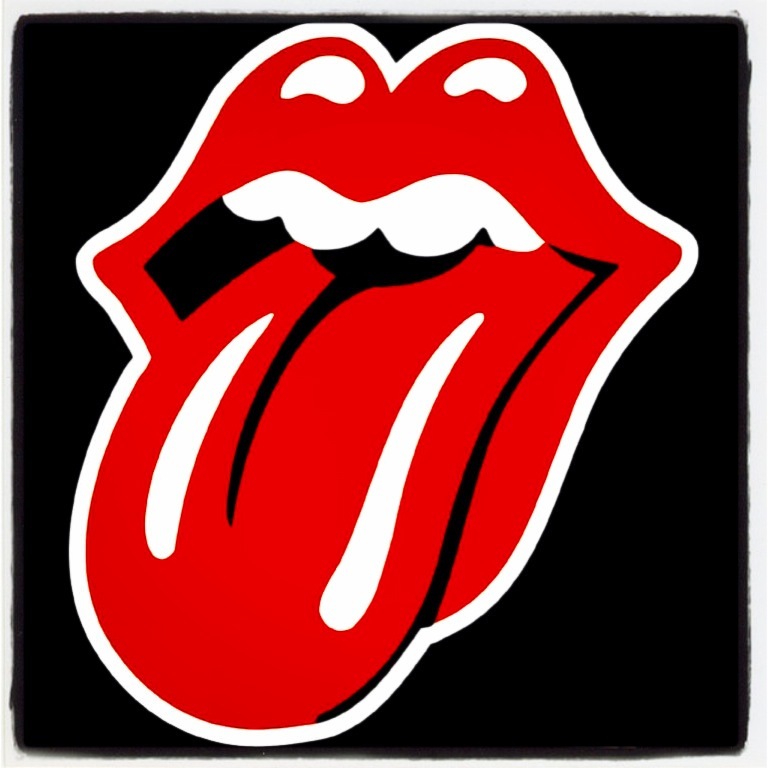 A new take on the band’s lip-and-tongue logo, designed by street artist Shepard Fairey (founder of OBEY) was released as part of the 50th celebrations.